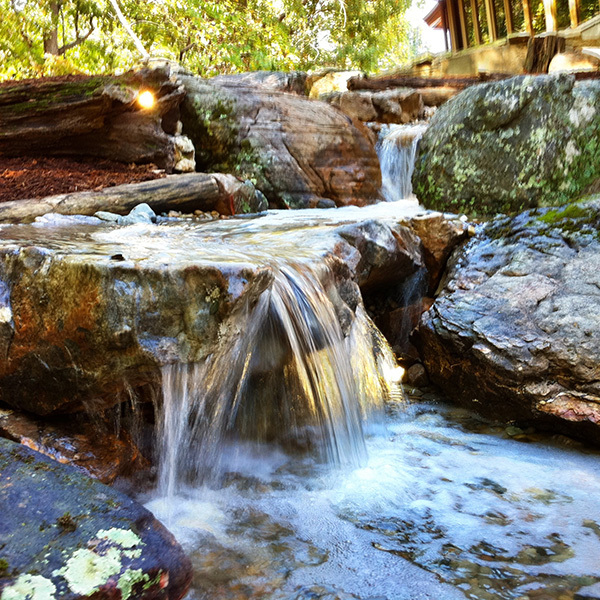 Ponds and waterfalls become the backyard retreat for our customers. A place to unwind and let all the worries of the day slip away while watching majestic koi swim gracefully through lily pads. The sound of the waterfalls transport our customers to another place, where the beating sounds of a keyboard are replaced with that of babbling streams and croaking frogs. At Nature's Re-Creations, our specialty is unique, custom design and nature is our inspiration. We strive to create the most natural outdoor water features for your space and assure you that no one can build features like we do. An outdoor water feature from Nature's Re-Creations is truly an art form and, through our many years of experience, we have refined our style and technique to be the best in the industry. Anyone else can build a less expensive feature, but NO ONE can do it better than we do…guaranteed! Our outdoor water features range in all sizes. 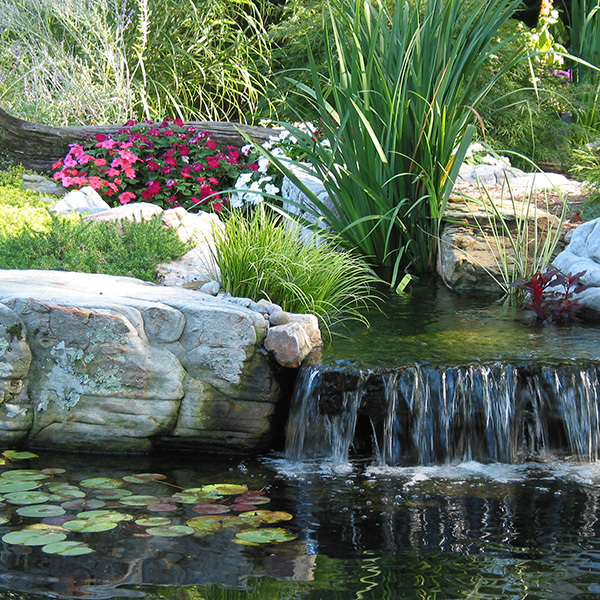 Small projects range from koi ponds and water gardens to subtle pondless waterfalls or even bubbling rock fountains or fountainscapes tucked into the corner of your landscape. 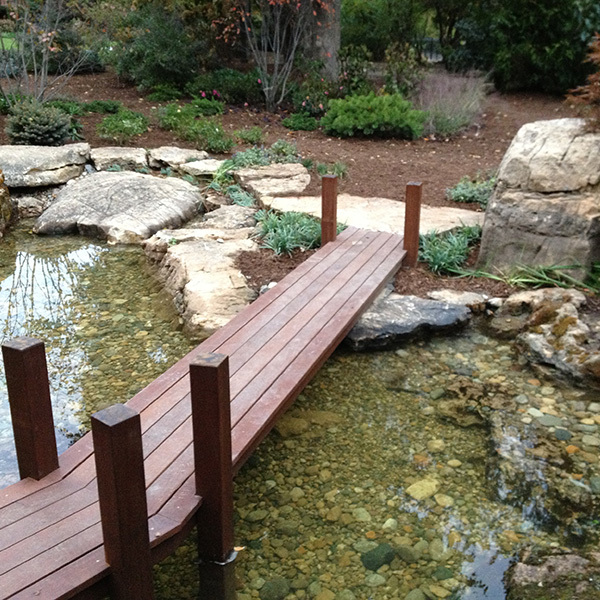 However, if you desire to re-create your favorite lakeside retreat or would like a natural swimming pond, we can get really creative and design the pond of your dreams with special features like split streams and falls, stone or land bridges, fish caves and negative edges. The sky is the limit when it comes to creativity. 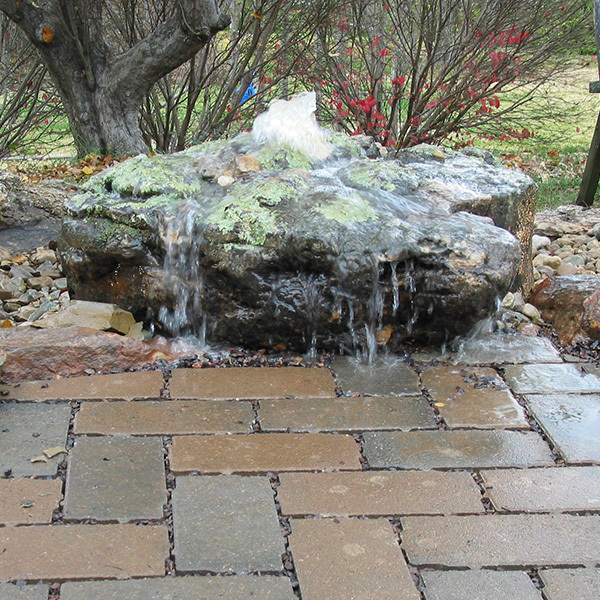 Outdoor water features typically range from $12,000 to $15,000 on the low end for most small ponds or pondless waterfalls, but bubbling rock fountains and fountainscapes could get you started in the $6,000-$12,000 range. Larger custom projects are so unique that it is difficult to value them until a design concept is created, but we are very comfortable with projects that top out from $100,000 to $300,000+ if you want to dream big. Because we value your time as much as our own, we do charge consultation fees starting at $150, depending on the scale of your project, for the owner/designer to meet with you to discuss your goals. Our crew will meet with you on-site to establish your goals with regards to design and budget. We produce a CAD design and estimate detailing all aspects of the work to be done. Tour of our work to pull out necessary details that can be worked into your feature. We will meet with you back on-site to lay out the plan in your space so you can fully understand the proposal and how the water feature will fit into your dream garden. A comprehensive plan and contract will be left with you to review and make your decision to proceed. Once a contract has been signed, you are placed on our construction schedule. We are typically booked up 2-8 weeks in advance, but depending on the time of year and season, that may vary. Upon acceptance of a contract, we will require a small deposit or retainer to hold your space on the schedule. Prior to starting your project, we collect the remaining 50% of the project's cost to begin the project. Upon completion of the project, we do not collect the remaining balance until you are 100% satisfied and you have been given your final walk through of the outdoor water feature installed. This is to ensure you are aware of all the maintenance and care aspects of your system and to answer any questions you may have regarding your new water feature. We want to ensure that you are completely comfortable with the operation of your feature before we leave and inform you that we also offer maintenance in case you wish to have assistance in maintaining your oasis. At that time, we collect the remaining balance as well as any change orders requested.